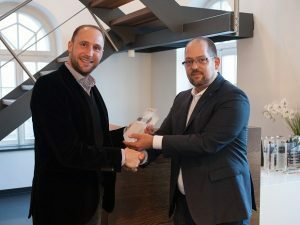 Our distributor for the Germany-Austria-Switzerland region has once again received the award for exceptional sales figures, repeating the victories of 2014 and 2015! As such, EBERTLANG remains the MailStore distributor with the strongest sales worldwide. This special distributor for infrastructure software, headquartered in Wetzlar, Germany, has very successfully marketed our MailStore Server email archiving solution in Germany, Austria, and Switzerland since 2010. In 2016 EBERTLANG was able to increase MailStore sales by 24 percent compared to the previous year. Sales to new customers also increased by 20 percent. Finally, the sales experts also increased the volume of orders by 27 percent. The main success factors for this growth are a comprehensive training program based on field use, targeted marketing and sales events for acquiring new customers, and a high level of specialized consultation. “EBERTLANG is our long-time, committed, and successful distributor for Germany, Austria, and Switzerland. Its team does an excellent job of supporting our channel partners, drawing upon in-depth product and industry expertise and exemplifying a high degree of professionalism. In doing so, the Wetzlar-based company has significantly contributed to our growth. We will continue to expand our channel activities in the future, as these are fundamental to ensuring the success of our business. EBERTLANG is playing a crucial role in this growth, as it is continually expanding our reseller network. We are pleased to honor the company’s special achievements by naming it the 2016 ‘VAD of the Year,’” said Philip Weber, Managing Director of MailStore.